India’s economy could also suffer some ill-effects without necessarily triggering retaliation via higher tariff barriers against Indian goods, says Devangshu Datta. 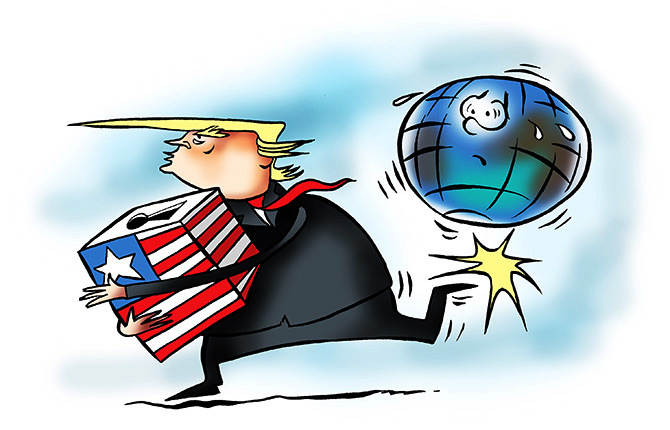 A “trade war” triggered by the US could be a defining factor that retards growth across the globe. Donald Trump proposes to impose a 25 per cent customs tariff on steel imports and a 10 per cent tariff on aluminium. In retaliation, the European Union (EU), Canada, Brazil, China, etc, have threatened to impose customs duties on US exports. In the meantime, India’s budget has imposed higher customs duties on a variety of items, though this hasn’t invited retaliatory action as of yet. Protectionism of this nature creates lose-lose situations. For example, while there could be jobs created in the US steel industry, the price of steel will rise in America. As steel prices rise, US construction costs will go up (since steel is essential raw material). So will the price of all items manufactured in America using steel. Ditto with aluminium, which is used in construction, aircraft and automobile manufacture, etc. That means inflation for Americans. It also means less demand for such products. Users of infrastructure will face higher costs as well. Construction services are driven by real estate development and by creation of new infrastructure - every sort of project in power, roads, transportation, telecom, etc, requires construction. Net-net, that will mean less jobs for Americans. Job losses downstream will outnumber jobs protected in metals production. In a more generic way, as inflation rises, consumption may ease down, leading to lower GDP growth. Meanwhile, jobs will also be lost in more competitive metals-producing countries, which can no longer export to the US. So, there will be a slowdown elsewhere as well. As the US-made goods become more expensive, America may decide to impose tariff barriers in downstream industries. Indeed, Trump has threatened import tariffs on European cars (and on Indian two-wheelers). And, of course, trade partners could retaliate. This sort of chain reaction can push the entire world into recession. It happened in the 1930s when every nation tried to protect respective domestic industry after the Great Crash of 1929. That made the Great Depression even worse as every national economy became less competitive and jobs were lost across the world as global demand fell off a cliff. Trade wars could have peculiar effects in the currency markets as well. Inflation will mean rate hikes. Rates hikes could translate into a stronger dollar and further slow GDP growth. Other nations may also try to maintain competitive export pricing by keeping currencies weak. One can't tell where such things will end but currency volatility is a given. As of now, dollar strengthening looks likely to be a theme for quite a while. Indian exporters to the US would be worried. India’s domestic economy could also suffer some ill-effects without necessarily triggering retaliation via higher tariff barriers against Indian goods. During decades of protectionism via placement of very high customs duties on all sorts of goods, India's domestic industries all turned into monopolies producing shoddy, over-priced goods. There were just two car models available for over 30 years, for instance. GDP growth was low, inflation was high and employment stagnated. From the financial traders' perspective, the rupee has lost ground against dollar, yen and euro in the past month. There has also been a shakeup in metals. The stocks of non-ferrous metal producers (aluminium, copper, zinc) have been hit hard. Indian steel manufacturers have done better, due to the positive effect of protectionist duties. In WTO feedback, India is among the many nations that have confessed to being seriously concerned about American protectionism. A weaker rupee could perhaps help with keeping exports competitive. But if every major economic bloc starts raising protectionist barriers, the quantum of global trade will just drop. There can be no winners really in such a war. Did India actually create 7 million jobs in 2017-18?